Both postcards have been sent, postmarked Linn Creek, but the dates are obscure – probably 1930s. 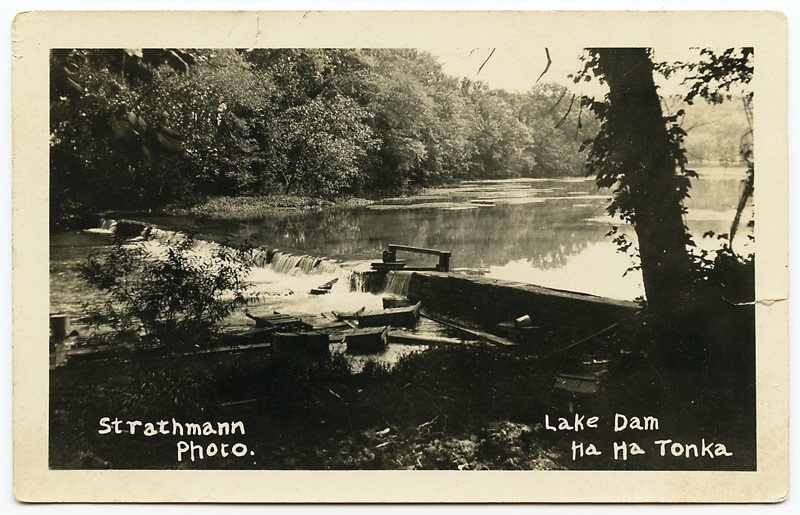 The exact origin of the low dam that created Ha Ha Tonka Lake is not clear. It’s possible that Colonel R. G. Scott, railroad promoter and real estate hustler, built it. He came from Iowa about 1890 and with a friend bought or optioned what was then known as Gunter Spring with a large parcel of land. 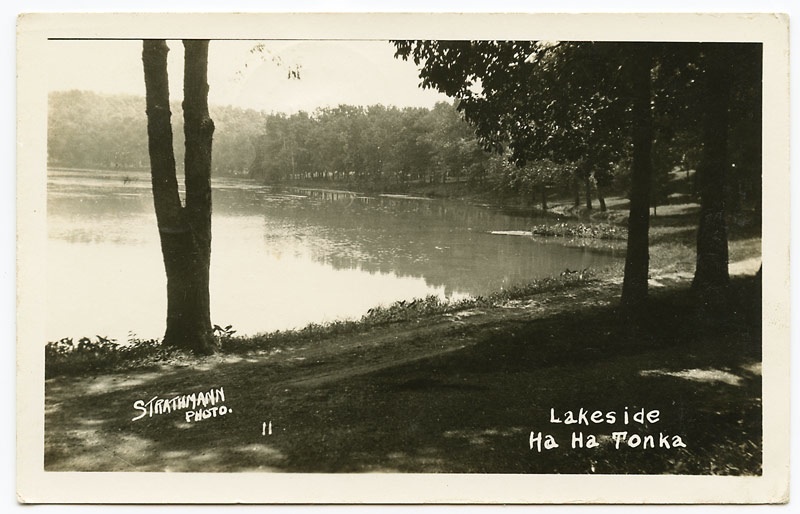 In 1904, Scott sold the land and spring – now fancifully renamed Ha Ha Tonka with a suitable Indian legend to fit the name – to businessman Robert McClure Snyder of Kansas City. The destruction of this little lake by the construction of Bagnell Dam caused a five year series of lawsuits and appeals. We devoted a significant part of the book (pages 92-97) to the lawsuit and subsequent appeals. The lawsuit pitted well-to-do people with big egos against a well-to-do corporation with an equally big ego. The first round began in 1930 when UE filed an exception to the award of $902/acre to the Snyder family for the acreage included with the trout lake. The Snyders sued and the lines were drawn. The plaintiffs claimed the new lake had degraded their estate more than a million dollars. High dollar lawyers and a high profile tale brought journalists to cover the lawsuit over ‘scenic beauty versus progress’. Witnesses during the ten-week trial included Gutzon Borglum, sculptor of Mount Rushmore, and W. H. Wurepel, who painted the mural of Ha Ha Tonka in the Missouri State Capitol. In 1932, the jury awarded the Snyder family $350,000. Naturally UE appealed. Round Two began in 1935. A new verdict awarding $200,000 to the Snyders caused them to appeal, but Judge Otis denied the motion for a third trial in 1936 allowing the $200,000 judgment to stand. Today the lake laps up against the old mill dam, but the trout dam is under water. I found this information very interesting as it helps fill in my family history as my Dad’s side lived in Old Linn Creek,Missouri. I would love to receive updates ..